Thank you to everyone who came and supported Kidderminster Art Society’s AGM on Thursday. I am sure you will agree that we have a great club with lots of varied activities with an active committee who dedicate a good deal of time and energy to ensure that we have an interesting , sometimes challenging, events programme and that everything runs smoothly. This year we welcomed some new committee members who replaced others who, having served for some time, decided it was time to stand down. A full list of the committee membes will be posted here soon. In the meantime, please find the Chairman’s report here. 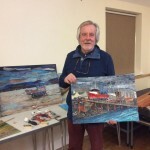 Tonight’s meeting is the Kidderminster Art Society’s AGM. This is an opportunity for members to nominate and vote for members to sit on the committee. Attendees will also have the chance to find out what events have been planned for the coming year. It’s going to be good! So come along and support your society. There are still a few tickets remaining so if you want to bring a friend then please do. Just pay on the door. Don’t forget to bring your drink and glass !! The tickets for the BBQ are now available. It is free for members but £5.00 for visitors. All tickets will be numbered and you must produce it on the night to get your food. Then the tickets will be put into a draw for a prize. You can bring your own alcohol and glass on the night if you so wish. Burgers, Chicken and Sausages on the BBQ. If you require vegetarian then please see a member of the committee. All members who have paid their subs will receive a Hard Back Sketch Pad to commemorate the 85th Year of Kidderminster Art Society. Those of you who enjoy sketching and painting outdoors then you may like to join a group that meets every Thursday morning for a few hours and there are lots of lovely venues for you to visit. See the list of meetings here.